Plans to open an upscale wine and craft beer shop in Downtown Norwood Park received strong support from more than a dozen residents at a community meeting July 23 hosted by Alderman Anthony Napolitano (41st). "We welcome you to the neighborhood," a resident told Emily Wilderman, owner of WineStyles, 105 S. Northwest Hwy., Park Ridge. Wilderman is seeking to relocate her business to 6182 N. Northwest Hwy. It would become the second liquor store in the Raven-Northwest Highway commercial district, much of which had been a "dry" precinct until about 10 years ago. The 2,700-square-foot storefront, where new windows have been installed, has been vacant for several years, according to Napolitano. A cleaners business operated there previously, he said. The project would require the lifting of moratoriums on the issuance of new liquor licenses along a two-block stretch on the southwest side of Northwest Highway. A package goods liquor license, an incidental liquor license and a food license would have to be issued before the store could open. Napolitano said after the meeting that he likely would have the moratoriums lifted given the unanimous support of residents during a voice vote taken at the meeting. He added that the moratoriums could be reinstated a year after the lifting. 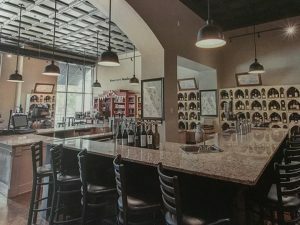 Wilderman said that her current 1,200-square-foot space is too small and that the new store would make it easier to host a variety of events, including wine tastings, educational workshops, book club meetings and private functions. The store would sell wine, craft beer, cheese, crackers and chocolates. The shop would close by 8 p.m. or 9 p.m. depending on the day of the week. "I don’t want it to be a bar. I don’t want it to be open to 2 a.m.," Wilderman said. There are about five on-site parking spaces, plus additional parking when a neighboring car wash is closed for business, Wilderman said. Norwood Park Chamber of Commerce executive director Alyssa Triptow said that Wilderman is no stranger to the area because the chamber has partnered with WineStyles on community events. Wilderman said that she hopes to move this fall but no later than January. The Iowa-based WineStyles has franchises in eight states.